Save time with our Easy Chili Recipe. 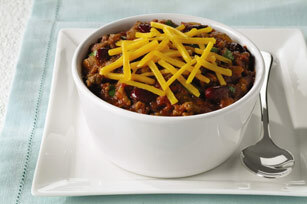 Our Easy Chili Recipe will have you enjoying hearty, spicy bowls of delicious chili in 25 minutes. Brown meat in Dutch oven or large deep skillet on medium heat; drain. Add onions and jalapeño peppers; cook 5 to 7 min. or until crisp-tender, stirring frequently. Add all remaining ingredients except cilantro and cheese; stir. Cover; simmer on low heat 1 hour, stirring occasionally. Serve topped with cilantro and cheese. Top each serving of chili with 1 Tbsp. BREAKSTONE'S or KNUDSEN Sour Cream. Cool, then refrigerate any leftovers. Reheat, then serve spooned over split hot baked potatoes.